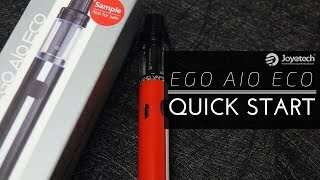 The Joyetech eGo AIO ECO Kit is an incredibly small and portable all-in-one device with simple features and a stylish look. With discreet dimensions of 14mm x 113m and an ultra lightweight of 37.4g, this little pen-style e-cigarette has all the convenience you could ask for. This kit comes with two drip tips that also act as a threaded top cap and are differentiated by small airflow holes versus slightly larger ones. Below the top cap is a 1.2mL integrated tank with a wide-open top-filling method that effectively helps prevent spills. Just like the previous Joyetech eGo AIO, the eGO AIO ECO Kit features a bright LED that sits inside the bottom of the tank. This LED offers one of seven different unique colors that can be used to illuminate the e-juice inside your tank. If you don’t like the flashiness of the internal LED or are trying to conserve battery life, you can easily disable the LED with a few simple clicks of the fire button. Powered by a pre-installed 650mAh battery that gives an approximate 350 puffs per charge, this eGO Kit features Joyetech’s all-new ECO technology. This technology gives the battery a very low and stable output, thus extending the battery life by almost double and making the kit more economic and efficient. Inside this vape pen is a 0.5 ohm MTL coil head that was meticulously crafted to provide the best possible vaping experience with e-liquid that contains higher nicotine levels including nicotine salt infused e-liquids. This atomizer head has a 6-8W rating for optimizing flavor at very low-wattages to accompany the new ECO technology. With a 1.85V output, the eGO AIO ECO Kit has over-charging, over-discharging, over-current protection, and dual circuit protection. Use the Micro-USB port to charge up your device before heading out for the day and be surprised at how long your battery will last. The Joyetech eGO AIO ECO Kit has a single button interface and comes in a variety of discreet but stylish colors for your convenience.